Totem Acoustic reveals £2200 Sky speakers | What Hi-Fi? We're fond of Totem Acoustic, with its plain but excellent-sounding speakers garnering a handful of five-star reviews over the years. And now the Canadian manufacturer has announced a new pair of speakers at CES 2017, called the Totem Sky. The Totem Sky is a two-way standmount speaker, with a 3cm tweeter and 13cm long-throw mid/bass driver. The speakers feature a 'unique borosilicate dampening' that helps to control standing waves inside the cabinet. Totem hasn't veered too far from its characteristically compact and minimal design. 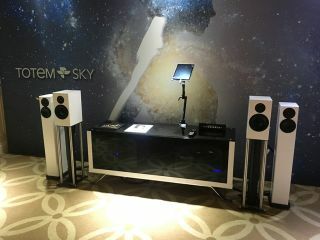 The Sky's chassis is hand-assembled and available three finishes - satin white, black and wood veneer. The speakers come with magnetic grilles that you can easily pop off. Around the back, you'll find two pairs of gold-plated terminals so you can bi-wire the speakers. The Totem Sky slots in above the existing Totem Rainmaker in the company's speaker range, and will cost a little more at £2200.